PD5212/64 is a Precision DirectivityT loudspeaker designed for applications requiring high output capability with excellent pattern control. 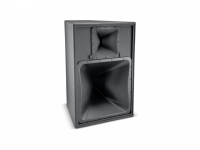 PD5212/64 can be utilized alone in music or speech systems where frequency extension to 80 Hz is adequate or combined with subwoofers to create extended bandwidth fullrange systems. 300 mm (12 in) horn-loaded LF and largeformat HF driver - high sensitivity design with high continuous SPL capability. SPL levels and smooth frequency response. Rotatable low and high frequency waveguide allow either horizontal or vertical cabinet orientation. Sophisticated, steep-slope passive crossover network with switchable bi-amp/passive crossover modes. Enclosure Trapezoidal with 12.5 degree side angles, 16 mm (5/8 in) exterior grade 11-ply Finnish birch plywood. Optional Weather Resistant Versions WRC for outdoor placement where the loudspeaker will be sheltered from direct exposure to the elements. WRX for direct exposure or extreme environments, such as tropical or beach, or in areas with salt air, extreme high humidity or rapid changes in temperature. See WRC / WRX configuration sheet for details. Optional Accessories 229-00009-01 kit of three M10 x 35 mm forged shoulder steel eyebolts.